(for an exploratory audio review of the film taught before a live audience, click HERE). I sat through Black Sabbath’s classic “Iron Man” tune, watching the film’s techno-credits dazzle until the familiar scroll kicked in. The friends who’d accompanied me and sat through the two-hour rocket of a film stood up from their seats, but then glanced back at me; I shook my head, pointed to the screen, and remained. With a sigh, they sat back down. The payoff was well worth it, whether you were astonished by the teaser scene that followed the movie’s credits or whether you just listened for the sound of comic fan-boys going into seizures throughout the auditorium. The guy with the Fantastic Four T-shirt behind me stared blankly at the screen and mumbled to his compatriot, “I think I just soiled myself.” An odd but awestruck offering on the altar of Stan Lee. Thankfully, I’m pretty sure he was joking. However, this thrill ride of a flick, propelled by tight, slick direction by Jon Favreau and fueled almost entirely on Robert Downey Jr.’s charisma, has an amazing test flight that sets a high bar for the summer movies to follow. 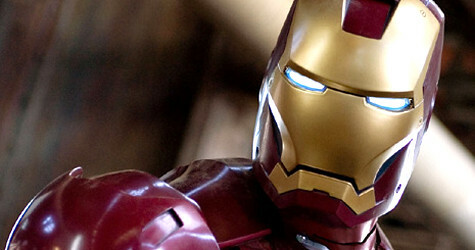 Although he’s been around the comics world since 1963, most people don’t know Iron Man like they do Spidey or the Hulk. Although some locations and situations are updated, the story basically remains the same. Billionaire Tony Stark (Downey Jr.) has everything; not only is he CEO of Stark Industries, which produces advance weapon systems for the U.S. military, he is a hedonist who seems to live in the moment. A fast talking, hard drinking ladies man, he is also a genius who has invented many of the high-tech items for the company. Demonstrating a new weapon for the United States Air Force in Afghanistan, his convoy is attacked by terrorists, and Stark is grievously wounded. His heart is irreparably damaged. Held hostage in a cave, terrorists force Tony to reproduce the new missile he was demonstrating. 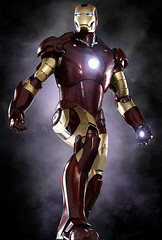 With life on the line, and a life-changing attack of conscience, Stark builds a powerful suit of armor and vows to amend his ways, using his genius and fortune to protect others. With the help of his personal assistant Pepper Potts (Gwyneth Paltrow), Air Force Lieut. 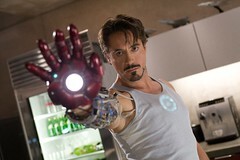 Colonel Jim Rhodes (Terrence Howard), and his computer assistant program Jarvis, Tony vows to protect the world as Iron Man. He must also contend with his shocked business partner, Obadiah Stane (Jeff Bridges). Although the superhero billionaire with lots of tech toys sounds suspiciously like Batman, the film is tonally closer to Spider-man, humor and slapstick mixed with the mechanized bombast of Michael Bay’s Transformers and an undeniable 80s sensibility as the movie starts with ACDC’s “Back in Black” and Downey Jr.’s fast-talking (which never stops, whether he’s trying to get the military to loosen up, get a reporter into bed, or get his computer to stop advising him against being impulsive). The movie barely lets you take a breath, sandwiching some serious commentary on war profiteering between repulsor blasts, amazing sets and special effects, fantastic dialogue, and sight gags. Iron Man is not the foundationally tragic, tormented hero like Bruce Wayne, but rather a spoiled, middle-aged hedonist who has realized much later in life than Peter Parker did that “with great power comes great responsibility”. This allows a more natural use of humor and fun to accompany his narrative journey. Using his fortune and abilities to right his wrongs, however, he DOES become obsessed by his mission, with a fervor to atone for wasted time and actions that have hurt others. 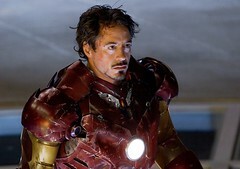 In one scene with Pepper Potts, Stark’s passion and conviction stop the humor short; the film demands from Downey Jr. the ability to shift Stark from silly or sarcastic to sober and serious, and he surprisingly succeeds with the nimbleness one expects is required to maneuver in that Iron Man suit. Tony Stark’s heart is cold and hard, and it takes this life-changing event to rip it out and give him a new heart that can walk in the light. His “heart change” is marked by the comic-book sized visual that remains central throughout the rest of the film. He’s like the Grinch whose heart grew three sizes that day… with copper wire and an ARC reactor. Moreover, as the reborn Tony Stark heads into combat against his enemies, he dons a suit of armor (which runs on the seemingly boundless energy he has been given by his new heart), a 21st century Spartan headed out to hold the line against the hordes of evil. There is a “bootstrap mentality” in the film which fails to capture the grand narrative of our lives. 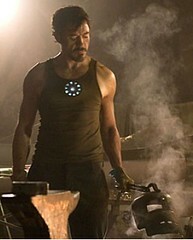 Stark’s reclamation, from the practical creation of his new heart to the armor he sports, is based almost entirely on his own intellect and resources. He is convicted of his sins and sets out to save himself… as if that were possible. There is a moment early in the film where a character sacrifices monumentally for Tony. There is another moment where a caring character in Tony’s life disobeys his instruction and does something that conflicts with his “disposable lifestyle”. This simple act of affection later ends up saving his life quite literally, and there is a sense throughout the film that he needs his friends, but the film still generally embraces the idea that we can fix our own brokenness and achieve atonement by our own devices. Like physicians, we heal ourselves, and perhaps “get by with a little help from our friends”. That might work on Oprah, or in a Beatles song, but I don’t believe that this fails to encapsulate the full story of our lives. In fact, the visual in this film – that there is one armored avenger swooping down from the sky to save us – almost paints a picture that we need a savior, but the imagery is muddled and admittedly intended to “wow”, not to proselytize. Still, while the story is flawed here in relation to mankind’s overarching metanarrative, it IS speaking to a lesser theme with great truth. From Scrooge to modern America, there is truth to the fact that we have been blessed with abundance and use if selfishly, unwisely, and even hurt others to maintain and advance. Tony Stark was born into Daddy’s wealth and gifted with a seeming natural aptitude for science and invention. These were not things he earned; they were gifts from his earthly father and his Creator. What have we done with the common grace that has been showered on us? We are too often hoarders or hedonists in Americana. I may not have Tony Stark’s wealth, but compared to the larger population of the world my middle class lifestyle is the spoils of a king. From my neighborhood to my country, am I seeking to make a difference with what I’ve been given? Am I missional in my mindset? Am I guarding my heart, putting on the proper armor, and engaging in a righteous crusade that expresses my love for God and my love for my neighbor? This is not the movie I expected from Jon Favreau, writer of Swingers. Christopher Nolan set the bar HIGH with Batman Begins, demonstrating that just because the source material is a comic book doesn’t mean you have to make a good comic book film; you can just make a good FILM. It’s true that Downey Jr. is the heart of the piece (no pun intended) and the the film, rises, falls, heats up or chills based on his performance (pun intended) but Paltrow, Howard and Bridges all orbit and add gravity to the piece; it’s obvious several of them will have larger roles in future installments and there are several nice nods to fans who know some of the coming story arc. Still, the film is NOT so insider in its language, nuance or style that a newcomer will feel as if he’s missing something. I suspect many will cough up the money to see this film in-theater more than once. Favreau has given us the kind of high flying summer blockbuster that is now going to make Prince Caspian, Hellboy, The Hulk, Indiana Jones, and even The Dark Knight work hard for their money. Hopefully a few of the upcoming comic book movies stink, otherwise – if these fanboys keep soiling themselves – the theaters will reek of geek awe. Go deeper into the mythos, fly higher with the narrative themes, by listening to the audio presentation given to a live audience after a showing of the film.